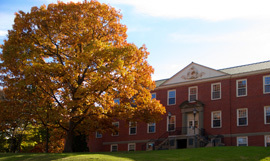 Begin typing to display the list of UNB buildings and locations. Please wait for a list of options to appear below the location box. Marshall d'Avray Hall built as a result of a bequest to honour Joseph Marshall de Brett. An Englishman who had grown up in the courts of France, Joseph Marshall de Brett, the second Baron d'Avray, first came to this province not to serve as a King's College professor but to establish, early in 1848, New Brunswick's first normal school for the training of teachers. Ludlow Hall named for the province's first chief justice, George Duncan Ludlow. The official opening of the Ludlow Hall in October 1968 included an address by John Turner, then was federal minister of justice. Built in 1968, it is named for the wife of New Brunswick's most prominent businessperson, K.C. Irving. 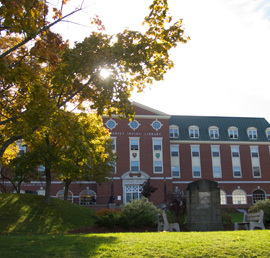 UNB libraries hold over one million bound volumes, three million microforms, 220,000 government documents, 49,000 maps, and 4,000 current print journals, as well as many rare books, manuscripts, the University archives and a number of other special collections. UNB's Biology building named for Prof. Loring W. Bailey who joined UNB in 1861 and taught for forty-six years, a record for continuous teaching that remains unbroken to this day. Reverend Wilfred Currier Keirstead was the formal designation of the popular professor known affectionately to his students as "Tubby". He was appointed professor of economics and philosophy at UNB, beginning a 36 year career as one of the university's most distinguished educators. Keirstead Hall, built in 1968 as the headquaters of the psychology department, is named in his honour. Home of the faculty of nursing, the building was named in honour of the first director of the school in 1968. Katherine MacLaggan, an outstanding nursing educator and scholar, wrote Portrait of Nursing which had a major impact on the development of nursing education on Canada. Founded in 1965 as the "Bio-Engineering Institute", the Institute has evolved to become a world renowned, multi-disciplinary research unit involved in a broad spectrum of activities in biomedical engineering. The Institute's mandate is to further education, research and community service in biomedical engineering. Forestry & Geology Building was an imposing addition to the campus in 1931. 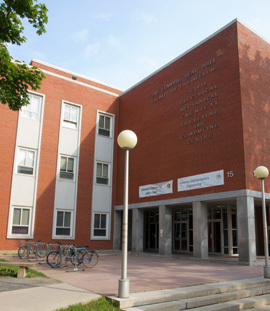 The first building to be considered home to the Faculty of Arts ï¿½ Carleton Hall ï¿½ was built in 1960. 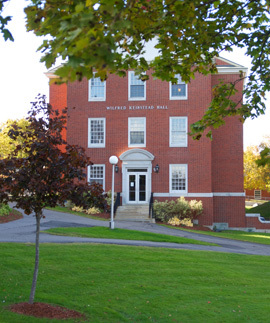 In 1987, a significant addition to Tilley Hall was made as a result of a bequest to honour Ethel Singer, the first Jewish woman to graduate from UNB. Opened in 1974. There are 24 doubles / 112 singles / 40 specials rooms available. 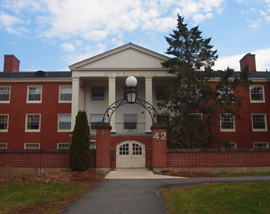 The University operates one apartment building, Magee House located on the Fredericton Campus. The building can accommodate 101 families in 49 one bedroom, 47 two bedroom and 5 three bedroom apartments. A war bride of a different stripe, Joy Kidd was a captain in the British armed forces when she met her husband, also an officer, and immigrated to Canada in 1945. Widowed in 1962, she worked in the financial aid office of the University of Toronto before coming to UNB in 1966 as dean of women's residences. She endorsed the concept of co-ed residences and, when she stepped down in 1985, welcomed the integration of the men's and women's residence systems. 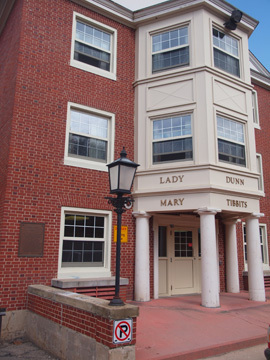 Lady Dunn Hall, the first on-campus women's residence, was orginally to have been called Mary K. Tibbits Hall, in recognition of UNB's first woman graduate. But Lord Beaverbrook decide just prior to the sod-turning in 1961 to name it in honour of Sir James Dunn's widow. Ladies were not permitted to enroll at the University until 1886 when Mary Kingsley Tibbits challenged this regulation and was the first, regularly admitted, female student. Opened in 1965. There are 39 doubles / 20 singles rooms available. Opened in 1962. There are 43 doubles / 14 singles rooms available. Opened in 1965. There are 43 doubles / 8 singles rooms available. Opened in 1961. There are 43 doubles / 8 singles rooms available. Thomas Harrison, who grew up in Sheffield, NB, was the first native New Brunswicker to serve as UNB president. Opened in 1958. There are 47 doubles / 1 single rooms available. 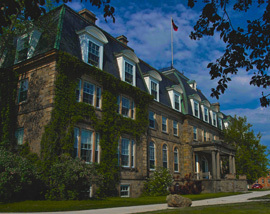 The first university residence was a gift from Lord Beaverbrook who, growing up in New Brunswick as William Maxwell Aitken, studied law, and over the succeeeding years developed an increasing interest in the welfare of the university. Other buildings brought into being through his efforts and those of his family were the Lady Beaverbrook Gymnasium, Aitken House, Ludlow Hall, and the Aitken Centre. 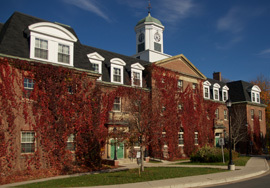 UNB considers residence living to be part of a student's total academic experience. 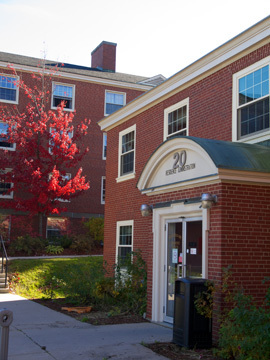 Residence l(2, ife at UNB aims to provide the student with an environment that encourages cultural, social, and intellectual growth within an academic context. 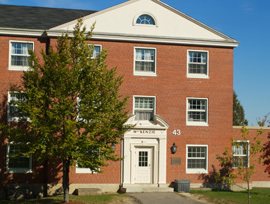 In the summer months the residences welcome individuals and groups to stay at UNB while visiting or meeting in Fredericton. All year around UNB offers meeting space, on-site catering and other services to people looking to meet on campus. A wide range of services are available and meetings, conferences, weddings, reunions and other special events are coordinated through Conference Services. 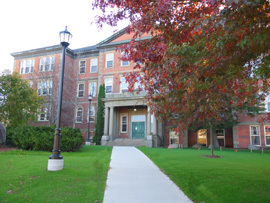 The building that housed King's College is now known as the Sir Howard Douglas Hall (Old Arts Building) and is the oldest university building in Canada still functioning as a viable part of a university campus. In the Great Hall are portraits of past presidents and two memorial stained glass windows. Immediately to the left of the front entrance is the Edwin Jacob Chapel, named in memory of the Vice-President and Principal of King's College. A permanent display illustrating the history of the University is located in the Great Hall, including the cornerstone of the building, laid in 1826 and excavated in 1978 prior to the sesquicentennial celebrations. Central Heating Plant provides electricity, steam, propane, furnace oil, and domestic hot and cold water to all campus facilities. Conservation efforts to save money are always a priority at UNB. Salt Storage Building is a part of UNB's Physical Plant facilities. 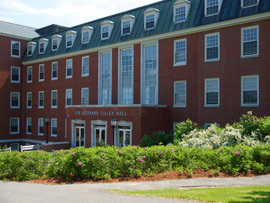 Building #7 is a part of UNB's Physical Plant facilities. 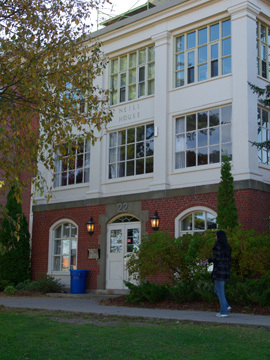 Header House is a part of UNB's Physical Plant facilities. Yellow Building is a part of UNB's Physical Plant facilities. Hut #5 is a part of UNB's Physical Plant facilities. Storage Shed is a part of UNB's Physical Plant facilities. 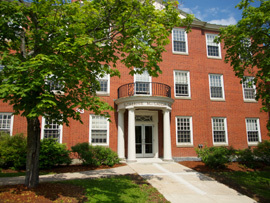 This building is the administrative centre for UNB's Facilities Management unit. Gymnasium facilities for the Faculty of Education used also for University Registration activiies and special events. 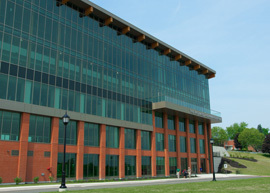 Aitken University Centre - University of New Brunswick's Multi Purpose facility. 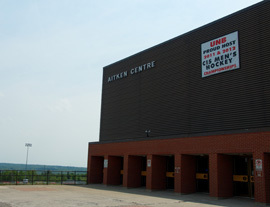 Opened in May of 1976 with the University Spring Encaenia and followed by a sell out Anne Murray Concert, the Aitken University Centre (AUC) has hosted in excess of 3,000 major ticketed Events during the past 22 years. 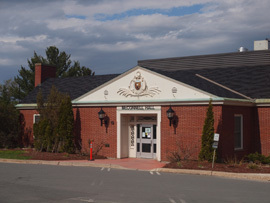 Owned and Managed privately by the University of New Brunswick, the Centre has played the role of the Municipal Civic Centre for the greater Fredericton region for all of those years. 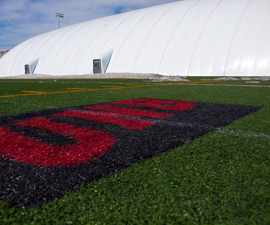 The University Dome is found on Chapman Field from December through April of each academic year. The Richard J. CURRIE CENTER is UNB's newest building and a beacon for health and wellness in the province. It boast several gymnasiums, fitness and exercise rooms, an indoor running track and an advanced human performance research lab. The Institute is proud of its research excellence and innovative business practices and values its R&D collaborations in information and telecommunications technologies with business, universities and government agencies, in Canada and around the world. Muriel McQueen Fergusson was a lawyer long before women would be accepted into the profession. She was a city councillor in Fredericton, the first woman senator from the Atlantic region and the first woman to serve as Speaker of the Senate. She was a tireless and uncompromising activist for the rights of women and the poor. She spent her life setting the standard for New Brunswick women and women everywhere. College Hill Daycare has 60 spaces available. These spaces can be applied for by affiliates of UNB / STU and non-affiliates. The ultramodern Wu Conference Centre is a state-of-the-art meeting and training facility, specifically designed to enhance educationally related activities such as conferences, seminars and workshops. The Centre is part of the University's pursuit of excellence in teaching, research and community service. As a Centennial project, the University brought to the campus and restored a one-room New Brunswick schoolhouse, located for more than a hundred years at Burden in York County. The schoolhouse, located at the King's College Road entrance, was officially opened in May 1967. 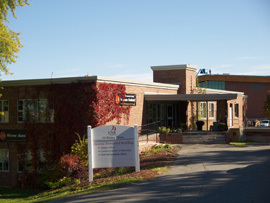 Operated by the University of New Brunswick, Enterprise UNB is a facility focused on enterprise and entrepreneurial development. Enterprise UNB is a direct link between the university and the business community and also provides business services to small enterprises allowing them to make the transition from a concept to a thriving business. 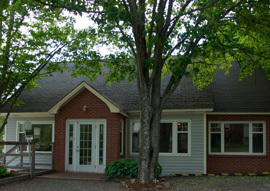 Enterprise UNB operates from the University of New Brunswick campus, Fredericton, New Brunswick, and provides services to both resident and outreach clients. Resident clients can lease space at affordable rates with all utilities provided including state of the art telecommunication facilities. 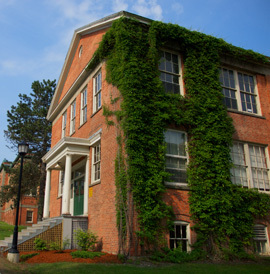 Originally built as a residence for University President Colin B. MacKay in 1957, Campus House is now the headquarters for the Centre for Conflict Studies as well as several scholarly journals such as Fiddlehead and Acadiensis. UNB's Fredericton campus bookstore, carries books, textbooks, computers, supplies, clothing and giftware. This building also houses a branch of the Bank of Montreal. 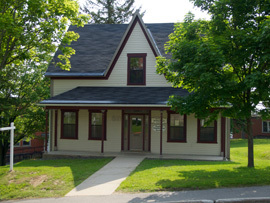 One-time residence of New Brunswick poet and author, Alden Nowlan, 676 Windsor now houses the UNB Graduate Students' Association. UNB's first library building was orginally presented to the university by the provincial government in January 1931. It was named in honour of Andrew Bonar Law, prime minister of Great Britain from 1922 to 1923, and R.B. Bennett, prime minister of Canada from 1930 to 1935. Both had been born in New Brunswick. 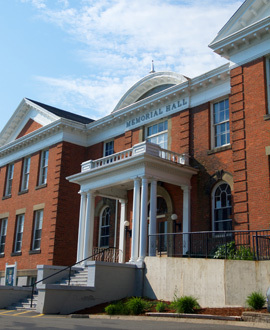 Built to honour the 35 UNB Alumni who died in the First World War, Memorial Hall was originally designed as a science building in 1924. 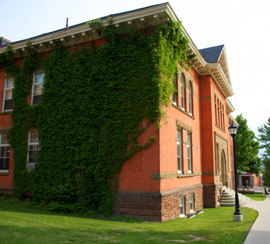 McCord Hall, located at the east entrance of the Sir Howard Douglas Hall (Old Arts Building), was once used as the University's ice house. The nineteenth-century structure was restored in 1963 and named in honour of David T.W. McCord, the distinguished writer and former executive director of the Harvard University Fund Council, and honorary graduate of UNB. 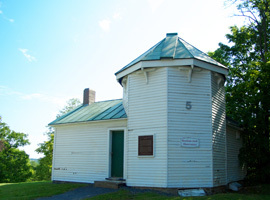 The Observatory, located at the east entrance to the Sir Howard Douglas Hall (Old Arts Building), was built in 1851 through the efforts of William Brydone Jack, Professor of Mathematics and Natural Philosophy at King's College and later President of UNB. Constructed of wood, it has an octagonal tower especially designed to house its equatorial telescope. It now houses a small museum. 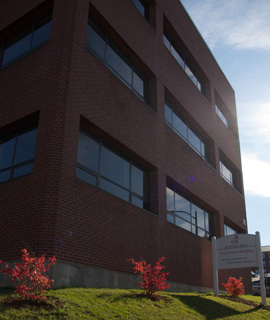 The Community Health Clinic (CHC) operated by the Faculty of Nursing, University of New Brunswick began operation on December 1, 2002 at its present location at 275 Brunswick Street. The University of New Brunswick and the Faculty of Nursing established the CHC to meet several pre-determined goals. At the University level the facility provides a way for the University to become more visible and connected to the community while fulfilling its mandate of teaching and research, as the CHC is being utilized as a teaching and research facility. For the Faculty of Nursing the CHC serves to provide access to primary health care services for persons living in the community. In addition, the CHC provides continuity for the service and teaching that has previously taken place in multiple facilities around the city for limited bursts of time. It also provides the additional benefit of being consistent resource for the development of a health research program, one of the University's top research priorities for the coming years. 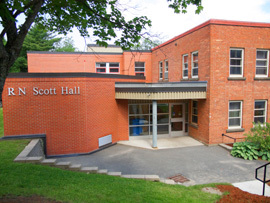 The Student Union Building was the result of a collaboration between UNB and St. Thomas Students and the UNB administration. Built in 1969, it was designed to provide student services that could no longer be accommodated in the Memorial Hall. he Neville Homestead, a small white clapboarded house on the east side of the campus, dates back to 1876. Fred Neville, University groundskeeper for 42 years, lived in the house from his birth in 1878 to his death in 1969. The Neville family first settled the land in 1850 with a purchase from the Hon. William Odell. In its 84th year, the house was moved a short distance to its present location to make way for a new men's residence, named to honour Mr. Neville. 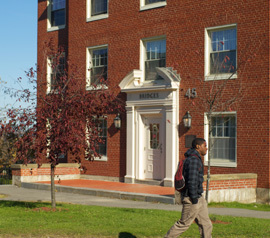 The Homestead now houses the Student Employment Service. 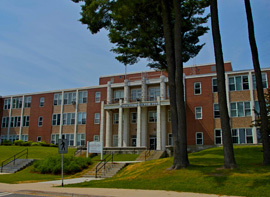 In 1955, the Alumni Memorial building was built to provide a central building for student services. It was widely considered to be the most modern and attractive in Canada at the time. 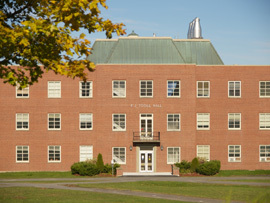 Finished in the summer of 1961, McConnell Hall was one of the most impressive buildings on the campus with its windows overlooking the St. John River. Department office of Catholic Studies, Political Science, Philosophy, Native Studies, Human Rights, Great Ideas, and English as a Second Language. Professional Studies Building of Bachelor of Education and Bachelor of Social Work. 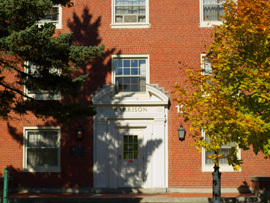 Department offices for Criminology, Gerontology and Criminal Justice Studies. 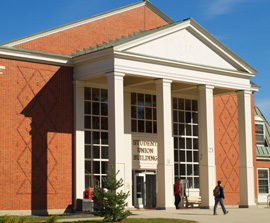 Ted Daigle Auditorium, Department offices for English, History, Irish Stuidies, Religious Studies, Anthropology, Economics, Environment and Society, Romantic Languages, Psychology, Sociology, and Women's Studies and Gender Studies. Cafeteria, Chaple, Campus Ministry, Dean of Students, Institutional Research, Financial Services, HR and Research Offices. 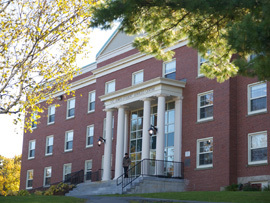 Noël A. Kinsella Auditorium, Dr. Daniel O'Brien Study Hall, President's and Vice-Presidents' Offices, Alumni Office, Department offices for Fine Arts, Math, Science and Technology Studies, and Journalism and Communications.